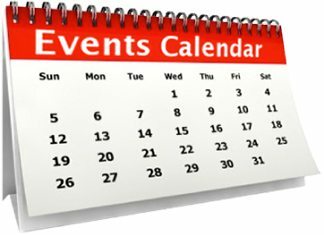 2017 saw the Norfolk Ocean Challenge enter it’s 3rd year on the outrigger events calendar. The NOC event consists of 3 race formats, including 27km Marathon, 12km Mid-distance and 1km sprint time trials. 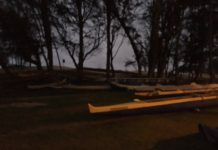 The event opened with a traditional canoe blessing conducted by island elders followed by an island fish feast put on by the Norfolk Island Wa’a Outrigger Club. Norfolk Islanders are the descendants of the English sailors that mutinied on the Bounty, and their Tahitian wives. The descendants were moved to Norfolk Island after the population outgrew Pitcairn Island, in 1856. 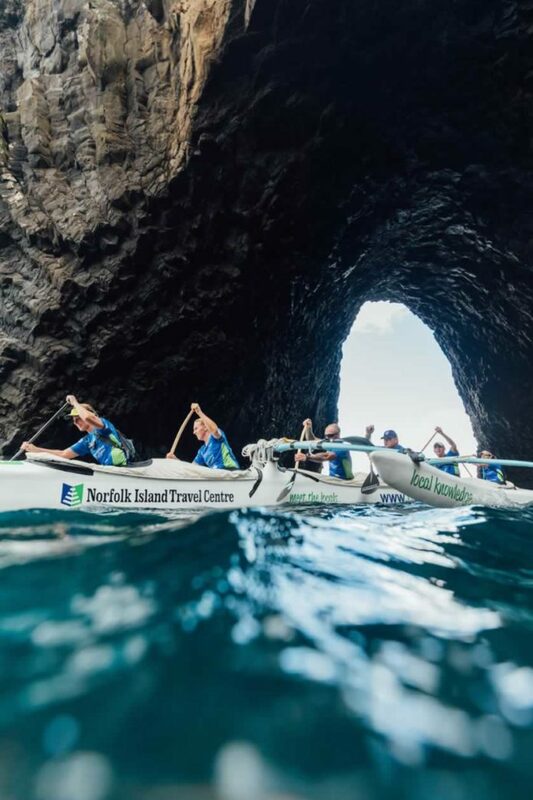 The first race conducted was the Norfolk Island Travel Centre Iron Marathon event. 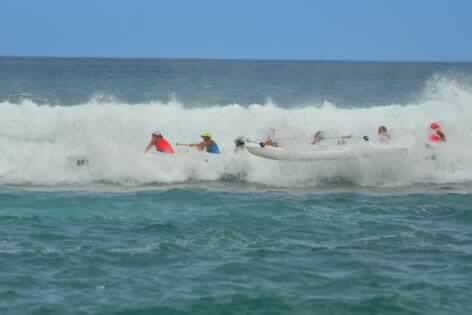 A sizeable swell hitting the entrance to the protected lagoon waters made for a challenging paddle to the race start. 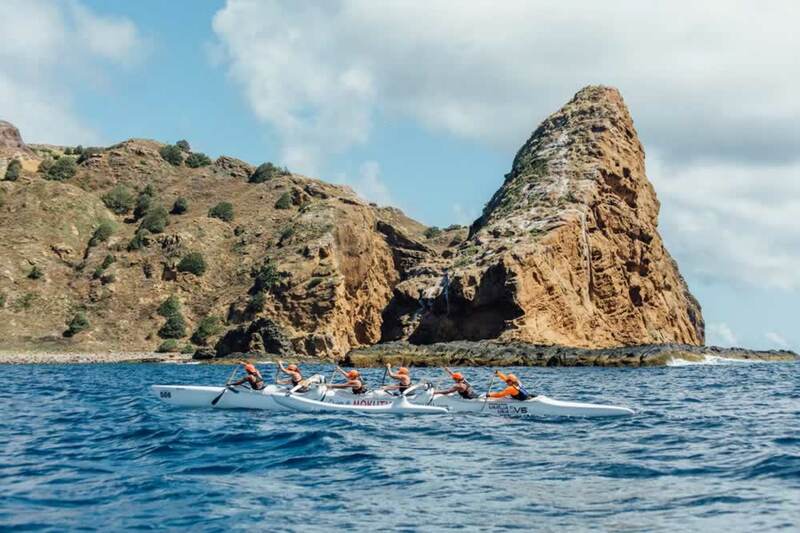 The round island race takes paddlers through the picturesque North east coastline and under a natural rock arch if conditions permit. Spectators and supporters can follow the race around the island by car, viewing from clifftop vantage points. Noosa Oceanswell SM men were first home with a time of 2:26:37 followed by local crew NIWOC Open men, 2:32:41, and Capricorn Coast SMM in third place, 2:38:28. In the mixed division, local crew NIWOC Open mixed grabbed line honours in 2:36:55 from 5 Islands (Woolongong Australia), 2:42.46 and Fatu SMmix, 2:56.56 in 3rd. 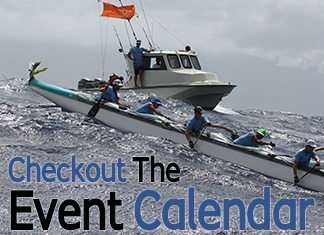 Arthritica SM women from Sunshine Coast Australia drew on their world wide paddling experience to win the women’s division, 2:45:31 with Pacifica Open women, 2:48.19, second and Bundaberg SM women, 2:50.52, in third place. The second event was the Pacific Direct Line Mid-distance 12km race, which traversed the sea to nearby Philip Island, situated 5km offshore. Strong currents and Northwesterly winds challenged the crews to the finish, again with NoosaSM men, 1:03:42, Arthritica SM women, 1:16:44, and NIWOC open mixed, 1:06:27, taking out their divisions in a much closer race than the marathon. 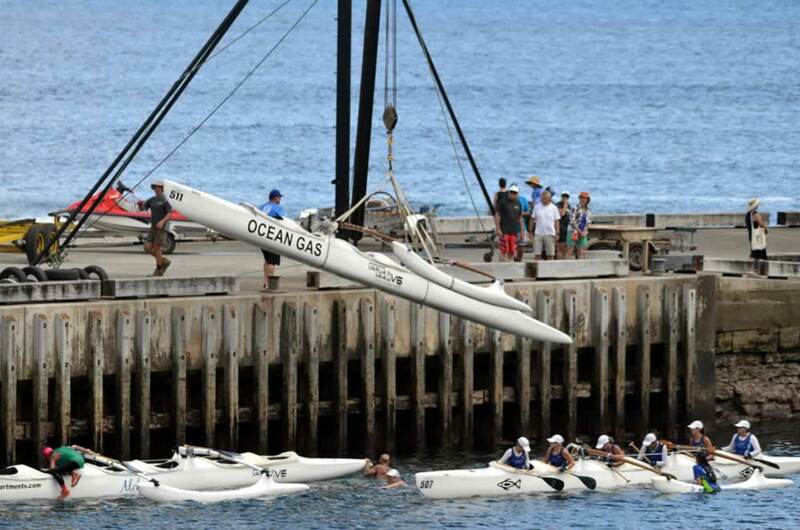 Something really interesting about this race is the need to use cranes to lift and lower canoes into the water and retrieve them (see photo). Following a much needed rest day, the Mokutu Chalet 1km sprint time trial commenced in high tide conditions within the only lagoon protected waters around Norfolk Island. 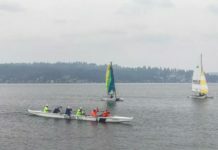 Each crew completed two time trials in the rough conditions. NIWOC Brad Open men’s crew fought hard to take out the sprint from Noosa Oceanswell men by the smallest of margins, with MNOCC5 in third. Bundaberg OCC SM women dominated the women’s sprint finishing in the quickest time in their second attempt ahead of Pacifica open women and Arthritica SM women. 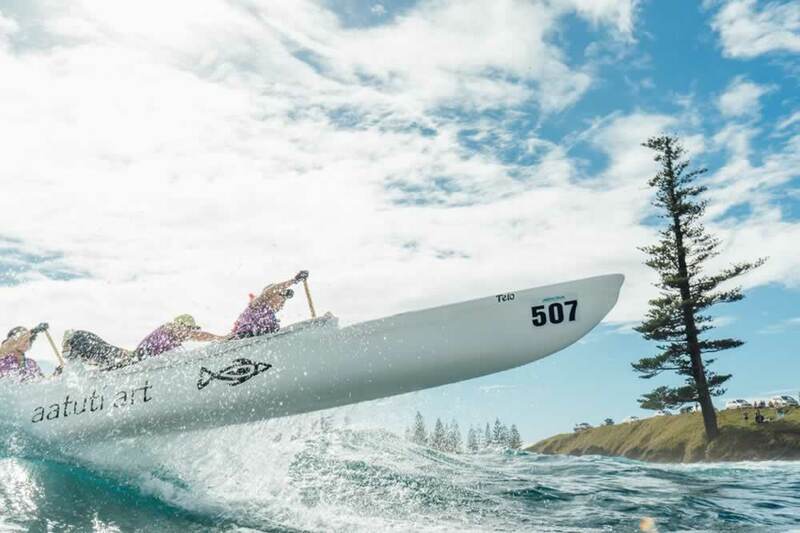 NIWOC Matt Open mixed crew called it a hat trick taking out the sprint event in the mixed division, ahead of 5 islands Te Raihe and Noosa Oceanswell Bodo in third place. No race would be complete without it’s fair share of drama. 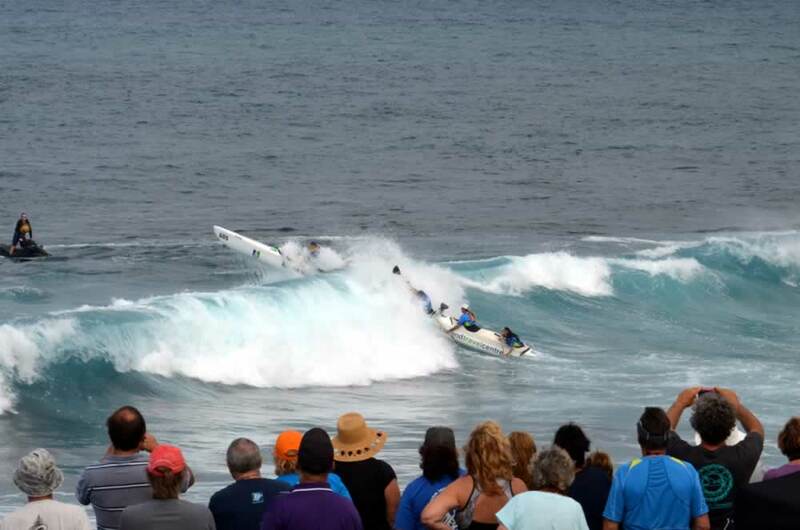 A spectacular huli in the women’s sprints saw 5islandNorfolk women’s SM crew get too close to the surf hitting the reef and were bowled over by a wall of white water. Local paddlers, Jane Rutledge and Beau Rutledge took out the 50m V1 lagoon dash in the women’s and men’s division respectively. The closing ceremony and medal presentations concluded the event with a sumptuous buffet dinner featuring signature Norfolk Island dishes, and entertainment by local musicians. Dates for the Norfolk Ocean Challenge 2018 are January 22-26. 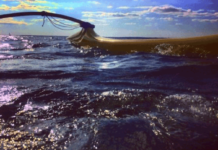 Email maria@travelcentre.nf to book a canoe, and check out the Norfolk Ocean Challenge facebook page. 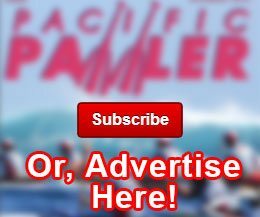 Entries are limited to 12 canoes per race event, with the U19 division included for the first time in 2018. You haven’t paddled the world until you’ve paddled Norfolk Island.